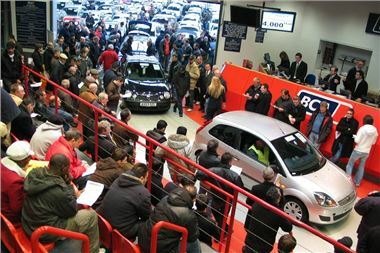 The March plate change is looming and, according to British Car Auctions (BCA), this is good news for used car buyers too. "New car sales for the March plate change may not be as busy as previous years, but there will still be plenty of 'pull-through' of part-exchanged motors for the used car market," explains Tim Naylor, of BCA. "At this time of year we have surge of fresh stock at our auctions across the UK, which means an even better range of good quality used vehicles at great prices. "In particular, we will be getting a lot of well-maintained used cars in from fleets and leasing companies who buy new in March. So motorists will be spoilt for choice. They will be able to pick-up what would have been some very expensive cars at new, for a fraction of the price. Some models that cost £50,000 to £60,000 new three or four years ago will go for between £15,000 and £20,000 at auction. "And private used car buyers don't need to be afraid of the auction process - as long as they prepare, they could get a very good deal. The March auctions will have a price to suit every budget. We will have cars being sold from a few hundred pounds up to £100,000. From superminis to supercars there will be something for everyone." BCA is also providing auction 'first-timers' with useful tips on how to make sure they get the best deal. Don't buy on your first visit - sample the atmosphere and get used to the pace. Do your homework - know what you want before you go to an auction and have an idea what the car you are after is worth. Terms and conditions - each auction house has its own terms and conditions explaining how you can buy, what the fees are etc. Familiarise yourself with these so that you don't get surprised later on. Don't rush - arrive early and take time to examine the vehicle that interests you. Do ask questions - ask auction staff, they will be happy to help. Check the car - it's up to you to check the car's condition, so examine it prior to entering the auction hall. And listen to the engine running as it is driven into the auction hall. All the right documents - check with the auctioneer to see if the vehicle comes with the V5, service history and an MOT to confirm the registered keeper, their address and the vehicle information. One careful owner - look for one-owner, direct-entered cars from fleets, leasing companies and private vendors for good value and well-serviced vehicles. Sold as seen - remember to check the exterior and interior condition of the car, as these elements are sold as seen. If you don't know much about cars, then bring someone who does. Budget - set a limit and stick to it. Save some funds for a post sale service and any minor repairs that might be needed. Be flexible - if you miss your first choice, don't give up and don't throw the budget out the window just because you like the colour of the car you're bidding on. Auctioneer's description - this is legally binding (and recorded), so listen carefully. The terms and conditions will explain all the terminology used. Bid clearly - don't wink or tap your nose, simply raise your hand or the catalogue.